A tiny snail may offer an alternative to opioids for pain relief. Scientists at the University of Utah have found a compound that blocks pain by targeting a pathway not associated with opioids. Research in rodents indicates that the benefits continue long after the compound have cleared the body. The findings were reported online in the February 20 issue of the Proceedings of the National Academy of Sciences. The opioid crisis has reached epidemic proportions. Opioids is highly addictive and according to the Centers for Disease Control and Prevention, 91 Americans die every day from an opioid overdose. The medical community is in need of alternative therapies that do not rely on the opioid pathways to relieve pain. "Nature has evolved molecules that are extremely sophisticated and can have unexpected applications," begins Baldomera Olivera, Ph.D., professor in biology at the University of Utah. "We were interested in using venoms to understand different pathways in the nervous system." 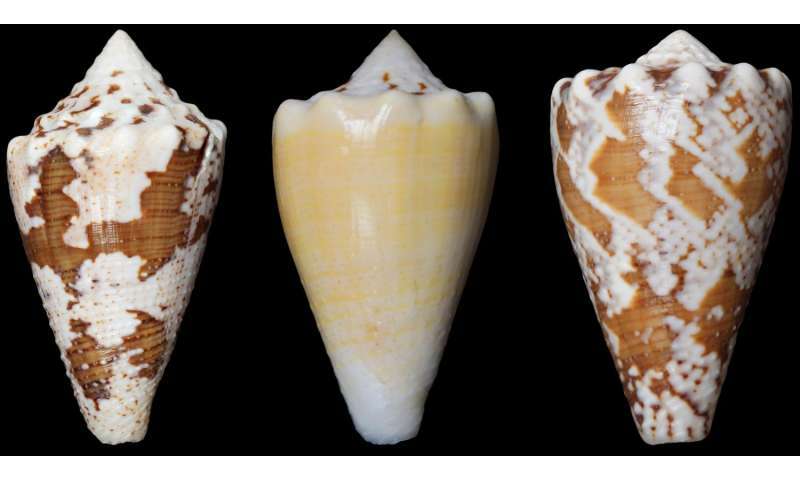 Conus regius, a small marine cone snail common to the Caribbean Sea, packs a venomous punch, capable of paralyzing and killing its prey. In this study, the researchers found that a compound isolated from snail's venom, Rg1A, acts on a pain pathway distinct from that targeted by opioid drugs. Using rodent models, the scientists showed that α9α10 nicotinic acetylcholine receptors (nAChR) functions as a pain pathway receptor and that RgIA4 is an effective compound to block this receptor. The pathway adds to a small number of nonopioid-based pathways that could be further developed to treat chronic pain. Interestingly, the duration of the pain relief is long, greatly outlasting the presence of the compound in the animal's system. The compound works its way through the body in 4 hours, but the scientists found the beneficial effects lingered. "We found that the compound was still working 72 hours after the injection, still preventing pain," said J. Michael McIntosh, M.D., professor of psychiatry at the University of Utah Health Sciences. The duration of the outcome may suggest that the snail compound has a restorative effect on some components of the nervous system. "What is particularly exciting about these results is the aspect of prevention," said McIntosh. "Once chronic pain has developed, it is difficult to treat. This compound offers a potential new pathway to prevent pain from developing in the first place and offer a new therapy to patients who have run out of options." The researchers will continue to the next step of pre-clinical testing to investigate the safety and effectiveness of a new drug therapy. Previous research had shown that RgIA was effective in rodents, but the scientists wanted to ensure they had a compound that would work in people. To do this, they used synthetic chemistry to engineer 20 analogs of the compound. In essence, the scientists started with a key (RgIA) that fits into a lock (the pain pathway receptor α9α10 nAChR). Using the key as a template, they developed new keys (analogs) with slightly different configurations. The scientists found one key that best fit the lock: the analog RgIA4 tightly bound to the human receptor. To test whether the compound relieved pain, the scientists administered it to rodents that were exposed to a chemotherapy drug that causes extreme cold sensitivity, as well as hypersensitivity to touch. "Interactions that are not normally painful, like sheets rubbing against the body or pants against the leg, becomes painful," said McIntosh. While the untreated rodents experienced pain after exposure to the chemotherapy drug, rodents given the compound did not experience pain. Nor did rodents that were genetically altered rodents to lack the pain pathway receptor. This work demonstrates that α9α10 nAChR acts as a pain pathway receptor, and that RgIA4 prevents the receptor from being activated. Most pain medications available today work through a limited number of pathways and are not sufficient to alleviate chronic pain. "RgIA4 works by an entirely new pathway, which opens the door for new opportunities to treat pain," said McIntosh. "We feel that drugs that work by this pathway may reduce burden of opioid use." Wasn't this been worked on in Australia about 10 years ago???? Whatever happened to that line of research?\Scientists seem to "discover" this in cone shells and snails every few years or so. So do we smoke it, snort it, or slam it? For chronic pain, and I repeat, chronic pain, smoke a moderate amount of weed now and again. The pain killing effects linger longer than the commonly used alternatives. Acetaminophen compromises the liver. Ibuprofen will eventually cause ulceration of the digestive tract. Opiates cause bowel obstruction. Pot is currently the safest pain killer available, and the burden of the responsibility of the potential effects of long term use should be shouldered by the user, the same way that cigarette smoking has been tolerated. Willy has been smoking the stuff all his life, still occasionally lights up, and he is 83 yrs old. @Cantdrive85, you place a snail on your scrotum and then antagonise the snail with a lighter. Sit back, and enjoy the ride. BHJ, you're correct (I don't know if it was Australian researchers, I didn't check-- I'll leave that to you ;) ) and there's a drug called Prialt that's made from cone snail venom. However, it has one problem: it won't cross the blood-brain barrier, so it has to be directly injected into the CSF, usually in the back of the neck. Not exactly convenient in a non-hospital situation. It will be interesting if this drug has the same drawback. Kratom also seems to be a safe effective opioid substitute for many people dealing with chronic pain who might not be able to get cannabis legally. Dunno. The list of possible side effects doesn't sound very pleasing: anxiety, nausea, itching, tachycardia, dizzness, sweating, dry mouth, constipation, and in prolonged use tremor, anorexia, weight loss, seizures, and psychosis. And the withdrawal symptoms list: irritability, feelings of distress, nausea, hypertension, insomnia, runny nose, muscle and joint pain, and diarrhea. It seems to be "safe" in the sense that it's harder to overdose. Otherwise it seems just as nasty as any opioid. From the article: "The duration of the outcome may suggest that the snail compound has a restorative effect on some components of the nervous system." Actually an undetected effect which outlasts the presence of the chemical could be restorative or destructive. Which is more likely? Is this stuff addictive? Seems to me any substance that puts you from a painful into a pain-free state would carry that risk. Holey balls was that something... A conch like no other I've experienced. Call Merck, this may very well be competition for Viagra too. it all depends on the individual. For some people it is a life saver. Some have no ill effects others the side effects out way the alternative. The pharmaceutical industry would like you not to have a choice. One company just spent half a million to stop cannabis legalization in Arizona because it would impact shareholder profits.